Sure, But Where Is the “Veritas” In the Vino? To drink or not to drink, that is the question. How many glasses of wine, should we drink, if any at all? I am lost. For years we heard that drinking a few glasses of red wine—let’s say, three for a male and two for a female per day—was a pleasant and effective way to save your heart. They called it the French paradox, because statistically speaking, the French of the Southwest, known for indulging in red wine, had far less heart conditions than the Anglo-Saxons. So for years, we embraced the French Paradox and applied—with respect—this medical recommendation. Although the French still excel in paradoxes, we keep monitoring troubling and contradictory information regarding the consumption of alcohol. A survey released by the University of Oxford in the U.K. and a study by the French National Cancer Institute both claim that alcohol is carcinogenic beginning with the absorption of the first glass of alcohol, including red wine. That’s scary! Another French study (by Cohorte Color), involving 100,000 persons over a span of 25 years, proclaims that if alcohol is indeed a risk factor, the moderate and regular consumption of red wine with a meal is associated with good health. That‘s not very different from what the popular wisdom has been for centuries. What we did not know, though, is the complexity of the chemistry of our body. 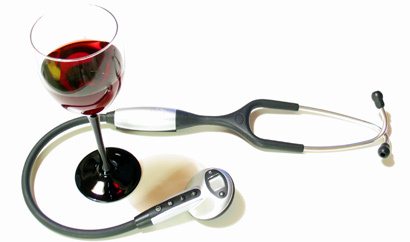 Wine is a factor, but not the only factor in the equation of our health. For instance, it works wonders with a diet rich in Omega-3 fatty acids, which is the case with the Mediterranean regimen (hence the French Paradox), but less with food too rich in Omega-6 such as British fare. To complicate the issue even more, the alarming Oxford study states that the risk of prostate and colon cancer is reduced with the consumption of red wine, and that, if alcohol in general is dangerous for the liver, wine has no impact on liver cancer. Of course, I respect and admire all of the scientists (all the more because I am proud to list my late brother Georges of the Institut Pasteur and Ecole Vétérinaire of Paris, who was known for his research on food and salmonella). However, until researchers agree on how many ounces or cubic centimeters I should drink, I will continue to sip my daily Cab or Pinot Noir with my meals.